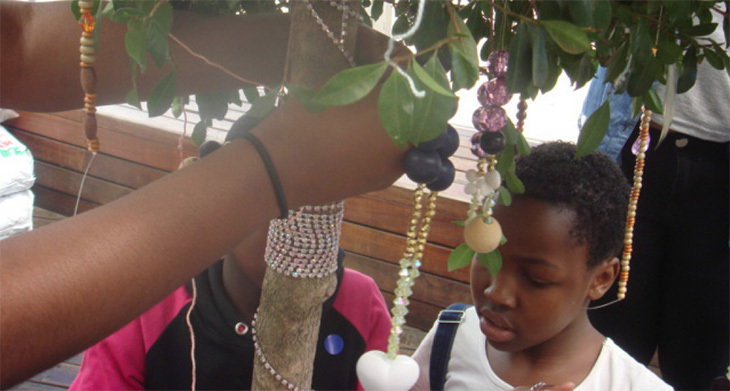 A special day for the children in homes in the inner city of Johannesburg was organised by Lefika La Phodiso at the restaurant area at Constitution Hill. One of the organisations participating was the Art Therapy Centre, which uses art to assist children to deal with their emotions, to develop self-esteem and to develop skills in art. The theme was about safe spaces and what is required to create a safe physical and emotional environment for children, in line with the Constitution. The guest speakers were Advocate Elsabe Steenhuisen of ProBono.Org and Luke Lamprecht, a social worker who chairs the Johannesburg Child Advocacy Forum (JCAF). Elsabe Steenhuisen demonstrated to the children how the law is creating safe spaces for children in need. She filled a glass bottle with sand, stones and water to illustrate that the law keeps children safe just as the bottle keeps the stones. Children should know that even if a situation seems hopeless, the law can still create a safe space, like the sand and water that finds a gap between the little stones. Luke Lamprecht conducted a question and answer session on the rights of children. The children talked about food, shelter, education, love, discipline, guidance, protection, respect, a safe environment and the time to play. The event ended with lunch and music by Zwai Bala.